All Rapid Fulfillment customers have Free Access to our Client CRM system to monitor the status of their customer orders and stock holding 24/7. Now with the launch of the Rapid Fulfillment App, this same access is available on Apple and Android mobile devices. 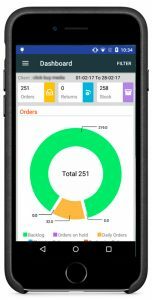 The Rapid Fulfillment mobile App shows the status of a clients customer orders through the daily cycle; from new orders in, and through the processing stages to shipping. The App also gives details of any orders which are in backlog or on hold pending stock replenishment. Each easy to read chart on the App allows for a further drill-down to the individual customer details, including a copy of the dispatch note once the order has been shipped. Clients can can also view their current stock holding by SKU and a breakdown of customer orders by country. And with the data being refreshed every 10 minutes it provides near ‘real-time’ status reporting. Historical reports of orders and stock for specific dates can also be run from the App, all accessible through a clear, easy to navigate dashboard. On signing up with Rapid Fulfillment, clients receive App log in details in an email from us and links to the App in iTunes and Google Play. The App can then quickly and simply be downloaded to a device, or multiple devices, a secure password created and all the data that’s needed to keep on top of customer order fulfilment is accessible wherever and whenever needed. If you’d like to know more about our Client CRM system and our mobile App, do get in touch.